How to SmartScan, email, or upload your receipts, and understand the difference between expenses, receipts, and documents. Let SmartScan do the work for you! What is the difference between a receipt, an expense, and a document? The receipt is in. What's next? We have a few different ways for how receipts can be uploaded to Expensify. By far the easiest, is SmartScan with your iPhone or Android device. Snap a picture, and forget about it! Forward email receipts directly into Expensify to receipts@expensify.com for SmartScanning - this is great for email receipts you receive from airlines and electronic receipts. 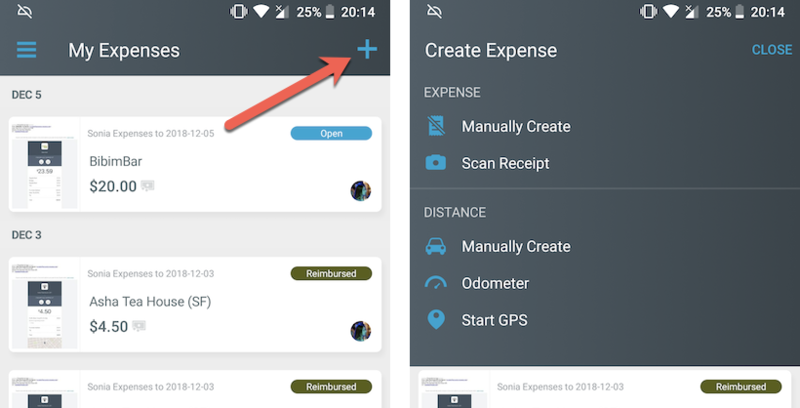 The final way is to directly upload receipts through the Expenses page or by dragging and dropping the receipt file into Expensify. Nobody likes typing or waiting for scans to finish; just snap it and forget it! It'll be auto-reported upon completion and auto-submitted that same night (or any frequency you desire) if your policy has Scheduled Submit enabled. Just scan your receipts immediately after making the purchase, and let us take care of them for you! Here is our ultimate SmartScan guide. To take a SmartScan photo with your mobile app, tap the green camera button, point and shoot! You can manually enter a transaction, create a time, distance, or per diem expense by tapping the + at the top right of the Expenses page and selecting the desired option. Please note, the available expense formats are dependent on the formats enabled in your policy settings. All receipts that are in your email, such as airline, rental car or hotel confirmations etc. can be forwarded to receipts@expensify.com. From here, they will be SmartScanned and an expense will be created for you! All of the receipt images will be processed and added to your account via SmartScan. Directly forward that email to receipts@expensify.com from your Expensify email address. Find it on the Expenses page, either listed under the date of the receipt (if the SmartScan has completed), or under the date that you forwarded the receipt (if the SmartScan has not completed extracting information from the receipt yet). You'll want to add that email as a secondary login to your account so that we can recognize that receipts from either of these email addresses should go straight to your own account. Follow the normal steps above once this is set up and forward these to receipts@expensify.com. Simply put their email address (and only their email address) in the subject of the email so that we know to apply it to that person's account. Forward to receipts@expensify.com and this should appear in their Expenses list. This expense will still be found on the Expenses list. As long as we were able to SmartScan this as a receipt with a date and amount (and not just an itinerary with no receipt information) you can find your trip details in the Trip section of your mobile app! Text/HTML email - Send in text email, TXT or HTML receipts (such as airline e-ticket itineraries or rental car contracts) and we’ll convert them into images that work just like all other receipts. Documents - Send in Microsoft Word, RTF, or PDF documents to convert them to receipt images. Click "New Expense" on the Expenses page. Select "Scan Receipt" and choose the file you would like to upload. 3. You can also drag and drop the receipt file into your account. In the case where you have additional documents to support your receipt you can add them to your report as Documents. To add a Document to your report click the Add Document icon on the left-hand side of your report and upload your file. 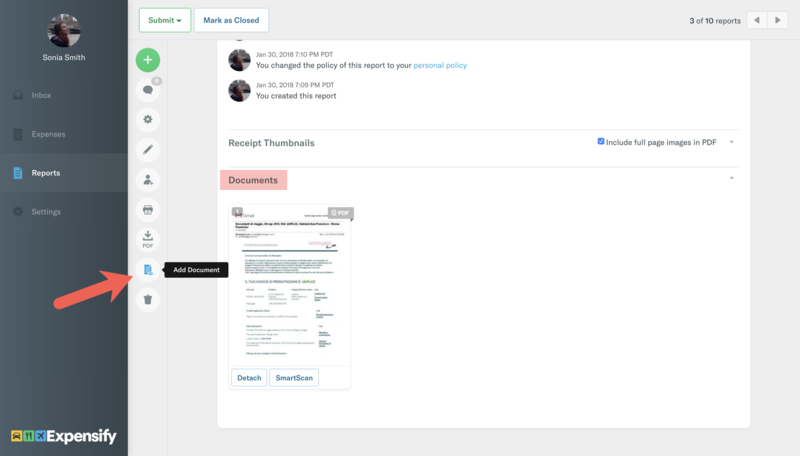 All supporting documents or receipts that were directly added to a report but did not get SmartScanned will be added to the Documents section which is found at the bottom of your report, right under the Receipt Thumbnails section. Receipts include the image of the receipt, as well as all expense information (the date, merchant, amount of the purchase as well as any categories, tags, etc.) In accounting terms, this is the "line item". When a receipt is SmartScanned, the result is this receipt with these details populated for you. This Receipt list could be receipts linked with a credit card expense, those waiting to link to a credit card expense, and receipts that do not have a credit card expense to match to (cash expense). Expenses are entries that do not yet have a receipt image. These are most often expenses imported from a personal, business or company card, but can also include manually created expenses. Documents can be added as attachments to the report. These do not contain expense information, and are not SmartScanned. They offer additional information to supplement the report, such as a bank statement. They can also be failed SmartScans, or receipts that are still SmartScanning. The receipt is in, what's next? Your receipt has been added to Expensify and entered as an expense either by SmartScan or manually. Company not using Scheduled Submit? You can still set this up yourself in your Account Settings so that your expenses are submitted automatically. If neither of these options are for you, learn how to create a report manually. How do I get an unlimited number of SmartScans? If you belong to your company’s policy, you have unlimited SmartScans automatically. However, if you’re an individual user, purchase the Monthly Subscription to gain access to limitless SmartScans. I don't see the receipt that I forwarded via email to my account. Double-check that you did not send the receipt to concierge@expensify.com. Sometimes, email clients' contacts save our "Receipt Forwarder" email as this email address instead, which will not get your receipt to the correct place! It's possible that the receipt is in the account, but you are having trouble locating it. Try opening up the various date filters on the Expenses page to reflect the correct date. If the SmartScan failed or has not completed, the receipt will be located under the date it was forwarded. If the SmartScan has completed, you can find it under the purchase date of the receipt. Always check your Deleted folder too! Check to make sure that the email receipt was a valid file format. Accepted file types can be found in the section directly above this Troubleshooting section. I found my receipt, but the image is blank or a string of scrambled characters. Is the receipt a valid file format? Accepted file types can be found in the section directly above this Troubleshooting section. Are there unrelated attachments on the email? Make sure that the only attachments are items that will need to be SmartScanned. Our system might get a little confused if there are extraneous attachments! Are you using other images in your signature (such as social media logos)? Sometimes, this can throw things off as well. Please try deleting any such images and forwarding the email again. Are you using Outlook? A couple factors can interfere with outgoing Outlook emails. If you are using Digital Signatures, try unchecking this option (you'll find this under the the envelope and lock icon at the top of your email draft screen). Also, Outlook's encryption can sometimes come into play; if your organization is encrypting emails upon them sending, then this might result in us not receiving the image correctly. Check with your company's IT department if you aren't sure if your email is being encrypted. I don't see the receipt that I forwarded via email to my Copilot's account. First, check the troubleshooting steps above, which should apply to any emails you forward. Double-check that you do do have access as a Copilot to this person's account. Go to Settings > Your Account and scroll down to Copilot: Delegated Access to check for any and all users you can Copilot for. Make sure that you are sending the receipt to receipts@expensify.com and you have only the email address of the person's account in the subject line (with no other text). Still looking for answers? Search our Community for more!